Water Softeners: Hard water is water that contains a large amount of minerals. Water softeners reduce the mineral content of water, thus 'softening' it. While drinking hard water is not harmful to your health, over time it can have a damaging effect on the plumbing and appliances in your home. For this reason a water softener is recommended to reduce the hardness of your water and extend the life of your plumbing and appliances. 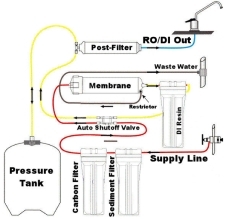 Reverse Osmosis: Reverse osmosis is used to remove impurities from water in order to improve the taste, colour, or other properties. These filters work by forcing water through a semipermeable membrane which allows water to pass through but will stop the contaminates. Ultraviolet: A water filter removes impurities from water by means of a fine physical barrier or a chemical process. 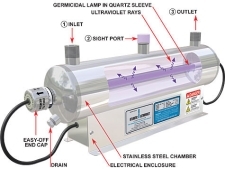 Ultraviolet germicidal irradiation (UVGI) is a disinfection method that uses ultraviolet (UV) light to kill microorganisms. It is used in a variety of applications, such as food, air and water purification. We recommend that your water treatment system be serviced once a year; this involves shocking your system and replacing any UV bulbs and filters. We have invested in a custom database to allow us to keep track of the maintenance schedules for your systems. This tool will help us provide unparalleled service to our valued customer. Providing us with your email address will allow us to remind you of scheduled maintenance (UV systems, Backflow Preventors, Water Softeners, Outside taps to prevent freezing). Our database can hold photographs of all your plumbing fixtures, model numbers, and shut-off valve locations to ensure that any service required can be completed quickly and easily. We use Excalibur Water Systems for all our water treatment needs. Excalibur is a Canadian manufacturer of water treatment equipment such as water softeners, dealkalizers, condensate polishers, filtration equipment, reverse osmosis systems, and ultraviolet disinfection systems. Copyright � 2019 Vandermeulen Plumbing Ltd.
Did you receive junk email appearing to come from vandermeulenplumbing.ca? Please click here.